Location: Whiterock, County Down, Northern Ireland. Notes: Sketrick Castle is a castle situated on Sketrick Island near Whiterock, County Down, Northern Ireland. 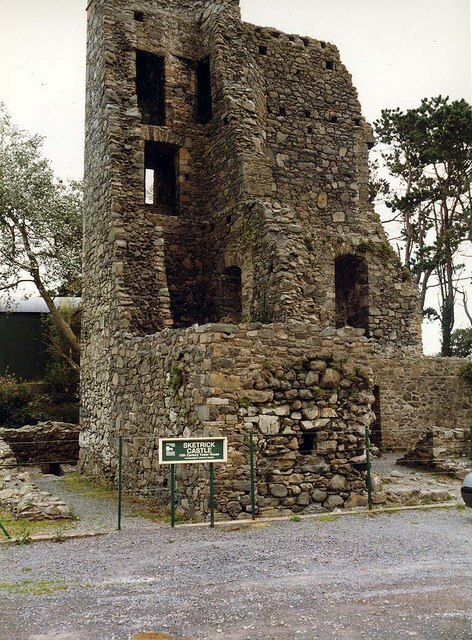 The castle is estimated to date back to the 12th century. Sketrick Castle tower-house and the passage to spring are State Care Historic Monuments in the townland of Sketrick Island, in Borough of Ards, at grid ref: J5245 6252. The castle dates from the late 12th century. In the 14th century it was acquired by Sir Robert Savage. The Annals of the Four Masters record the capture of the castle in 1470 by an army led by the O'Neill to assist the MacQuillans. They took the castle and it was given to MacQuillan for safe keeping. It was intact until 1896 when a storm demolished much of it.